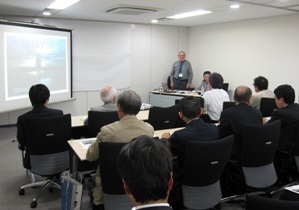 - Subject : A partnership approach to catchment wide river restoration: the Mersey Basin Campaign experience, U.K.
"The 5th JRRN River Environment Mini Lecture” was held on the afternoon of Tuesday, May 11, 2010. The lecture started with historical descriptions of the industrial revolution in Liverpool, Britain where the Mersey runs, to its decline. He described the water deterioration of the Mersey around the 1980s, using pictures from those days. Then, he discussed the Mersey Basin Campaign with three central pillars: economics, society, and restoration of natural environment. He explained its objectives, concept, and strategies in detail, as well as specific activities over the past 25 years and key factors for the success of the campaign. In a one-hour exchange of opinions after the lecture, the lecturer and participants actively exchanged opinions about the organizational structure and funds for the campaign, future development after the completion of activities, cooperation with citizens and enterprises, and specific examples of various large and small activities.